Fabletics, the innovative activewear brand co-founded by Kate Hudson in 2013, is excited to announce its first-ever collaboration. With the Fabletics mission to empower women by making a healthy, active lifestyle accessible to everyone – regardless of size, shape, age or ability – the new Demi Lovato for Fabletics limited-edition capsule collection reinforces their shared commitment to inclusion, female empowerment and body positivity. Featuring standout pieces inspired by her mission and her music, the first Demi Lovato for Fabletics collection reflects Demi’s authentic voice of female empowerment and unique style. The collection will support the brand’s ongoing partnership with the United Nations Foundation's Girl Up campaign – a “by girls, for girls” movement that empowers girls to become a force for change for girls everywhere. “When we first met, I remember being so impressed by how intelligent, accomplished and confident Demi was, even at such a young age. I loved her spirit, her honesty and how she was open to showing vulnerability, because that shows so much strength. She naturally came to mind as I was thinking about creating our first collaboration for Fabletics. Demi embodies so many elements of the Fabletics brand in such a unique way; she’s a definitive voice for female empowerment and body positivity – especially for the younger generation – which is something we believe in very strongly at Fabletics,” said Kate Hudson. The Demi Lovato for Fabletics collection will launch with an initial limited edition capsule collection in mid May 2017, which will include an assortment of tops and leggings, followed by a full performance collection in August 2017 ranging from bras and leggings to layering pieces including tops, jackets and much more. The collection reflects the fashion meets performance DNA of Fabletics, blended with styles inspired by Demi’s mission, music, and voice of female empowerment. As part of the Fabletics partnership with Girl Up, the brand is dedicated to creating a community that nurtures inspiring, confident, and spirited girls who are able to realize their best selves. 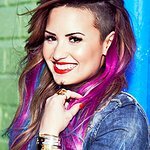 By integrating Demi’s authentic voice and passionate influence, Fabletics will further strengthen its efforts to raise funds and awareness for some of the world’s most marginalized adolescent girls, ensuring that they are educated, happy, healthy, safe, and positioned to be leaders in their communities, specifically, with the aim to support one of Girl Up’s priority initiatives, SchoolCycle. With approximately 130 million girls out of school globally, getting girls to school and keeping them there is of utmost importance. Girl Up’s SchoolCycle initiative works with UNFPA to give girls bikes – along with spare parts and maintenance training – so they can continue their education and travel quickly and safely to and from school. The bikes also give girls independence and mobility to create a better future for themselves, their families, and communities. The Demi Lovato for Fabletics capsule collection will be sold across 8 countries and will be available on the official website as well as in the 21 Fabletics stores nationwide.